For the second time in as many knee injuries, freshly-minted UFC lightweight champion Anthony Pettis (pictured) has dodged surgery. On Tuesday night’s edition of ESPN’s SportsCenter, UFC president Dana White revealed Pettis suffered a grade two PCL sprain and an LCL strain on his left knee during Saturday’s victory over Benson Henderson. A relieved White said Pettis will not be required to go under the knife because his wheel suffered no major tears. However, Pettis is facing seven to eight weeks of rehabilitation. White did not report whether that fantasy fight would take place at featherweight or lightweight. In addition, White didn’t say when Pettis would be making his first title defense because it would depend upon how well his knee responds to treatment. 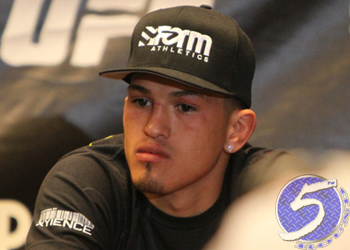 Prior to meeting Henderson, Pettis was initially slated to challenge Aldo for his featherweight crown at UFC 163. However, he was forced to withdraw after injuring his right knee. That wound also just took several weeks of rehab to heal, which allowed him to replace a concussed Grant to fight Henderson at UFC 164. Today’s MRI results certainly provided positive news for Pettis and White, who publicly shared his concerns after UFC 164 about losing another one of his budding superstars courtesy of the injury bug.